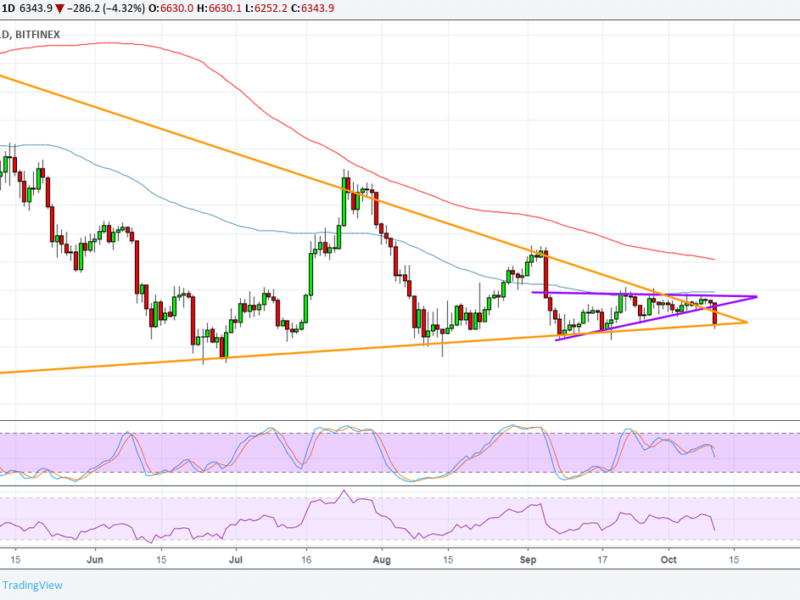 Bitcoin fell through its short-term triangle consolidation pattern to signal that further losses are in the cards. However, the longer-term triangle bottom is currently holding as support and may still offer a chance for bulls to get back in the game. The 100 SMA is below the longer-term 200 SMA, though, so the path of least resistance is to the downside. This simply means that support is more likely to break than to hold. In that case, Bitcoin could see a downtrend that’s the same height as the chart pattern, which spans $5,800 to around $10,000. Stochastic is on the move down on this time frame, also confirming that selling pressure could pick up. This oscillator has room to fall before hitting oversold levels, which means that bears could stay in control for much longer. RSI is also pointing down after previously treading sideways, also reflecting how sellers are regaining the upper hand. 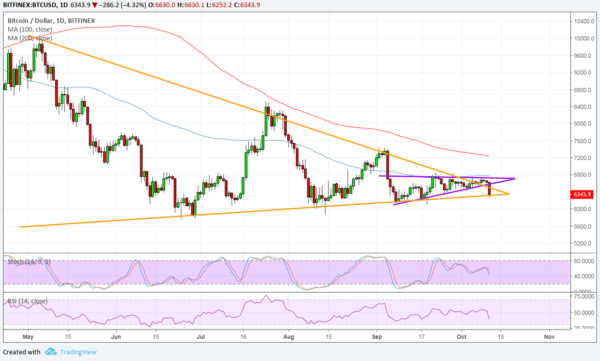 A bounce off this area, on the other hand, could still lead to a test of the triangle top and perhaps another upside breakout attempt. If so, bitcoin could be able to climb by the same height as the chart pattern. The pickup in risk aversion has hit cryptocurrencies hard as these are among the riskiest assets out there. Higher US bond yields in anticipation of more Fed hikes led to a flight to safety, leading traders to buy the dollar and cash out on their Bitcoin holdings. It didn’t help that Bitcoin and its peers were already on shaky footing after the IMF warned of dangers associated to cybersecurity and cryptocurrencies in their World Economic Outlook. Traders are also doubtful that the SEC could approve the bitcoin ETF applications anytime soon as the IMF emphasized the role of regulators to ensure consumer protection. On top of all that, weaker volumes across the industry over the past weeks has also allowed even smaller positions to cause market moves in either direction.